My massage career began before I even realized it– as an amateur. My path was paved to be a sports massage therapist by my heavy participation in sports with my friends. After an activity, they would always conveniently position themselves for me to rub their shoulders or back, and I loved giving them comfort for their sore and aching muscles. Time & again I was told I should make massage my chosen career as I was a natural –I could find tight & sore areas they never knew they had. Finally, after years of dismissing the idea, a weekend massage therapy course changed my mind. Our two year massage therapy program was comprehensive with in-depth study of anatomy, physiology & kinesiology along with Swedish massage techniques & more muscle specific focus through trigger point therapy & neuromuscular techniques. With all the different massage avenues, as well as my love of sports, sports massage therapy was a natural fit. My extensive knowledge of sport, along with 23 years massage experience has been sought by a variety of clients from the everyday fitness enthusiast to amateur & professional athletes (see the list of professional athletes and teams I have helped below). My belief in a pro-active approach to body health through therapeutic & sports massage has allowed me to work in a variety of clinical settings along side other health care professionals in the field of chiropractic & physiotherapy as well as injury rehabilitative facility. I also have extensive experience in with quadriplegic & paraplegic populations in both a home & hospital setting. There is a rewarding challenge that comes with teaming up with my clients and trouble shooting as to what their needs are and then designing a personalized sports massage program. The rewards are in knowing that through sports massage treatment and patient education, my clients will get back to the sport or activities they love to do as quickly as possible. I am an avid sports fan & a fitness enthusiast. Through my passions for competitive curling, weight training & cycling I know first hand the physical demands & challenges of a regular sports or fitness routine. For myself, I need fitness goals to keep me motivated to train. So through my weekly spin classes I decided to combine cycling for a charitable cause without the pressure of a race. My first commitment was the MS Bike Tour from Leduc to Camrose which was amazing & on a personal note, I continued & completed three tours of The Enbridge Ride to Conquer Cancer. I am proud to be your Massage Therapist in Edmonton for over 20 years, and I take great pride in being an active member in our community. I believe in making the world a better place by actively giving back through supporting a few charitable organizations that are known for making our community stronger. Exposing & giving learning opportunities to children through sport has long been a passion of mine. 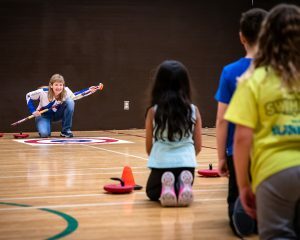 I have supported The “Rocks & Rings” program in a few Edmonton Schools, where the Olympic sport of curling is introduced to elementary school kids in their school gymnasium. This is a perfect way to give back to the sport that has given me so much. Whether you are a professional athlete or someone who simply loves an active lifestyle, my goal is to get you physically active again as soon as possible. If you are looking for a sports massage therapist who can implement a treatment, maintenance and/or prevention plan to keep you top shape, contact me to book an appointment. DarleeAnn Mathieson provides sports massage therapy to sports and fitness enthusiasts. She is based in Edmonton and focuses on helping her massage therapy clients prevent and heal from injuries as well as optimizing their performance.